While the world’s attention is focused on the Middle East, as usual, where ISIS – the creation of Washington’s Saudi and Gulf allies – is the focus of the latest alleged “terrorist threat,” a potentially more dangerous crisis is being ramped up by our professional regime-changers in the volatile Balkans. 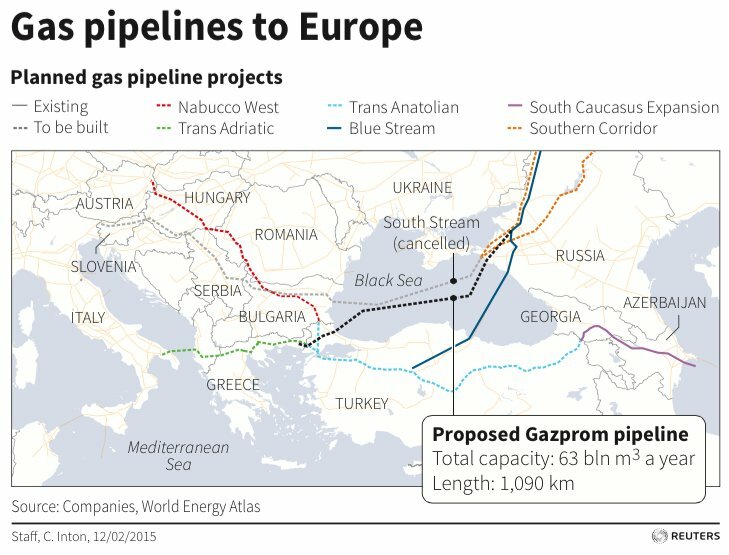 The Russian-Turkish plan to pipe Russian gas through Turkey and then on to Macedonia and thence into southern Europe has long been opposed by the West, which is seeking to block the Russians at every turn. Now the Western powers have found an effective way to stop it: by overthrowing the pro-Russian government of Macedonian Prime Minister Nikola Gruevski. The original plan was for the pipeline to go through Bulgaria, but Western pressure on the government there nixed that and so the alternative was to pipe the gas through Macedonia and Greece. With the Greeks uninterested in taking dictation from the EU – and relatively impervious, at the moment, to Western-sponsored regime change – the Macedonians were deemed to be the weak link in the pro-Russian chain. That was the cue for the perpetually aggrieved Albanians to play their historic role as the West’s willing proxies. After a long period of dormancy, suddenly the “National Liberation Army” (NLA) of separatist Albanians rose up, commandeering police stations in Kumanovo and a nearby village earlier this month. A 16-hour gun battle ensued, with 8 Macedonian police and 14 terrorists killed in the fighting. The NLA, which reportedly received vital assistance from Western powers during the 2001 insurgency, claimed responsibility for the attacks. During the 2001 Albanian insurgency, an outgrowth of the Kosovo war, the EU/US used the NLA as a battering ram against the Slavic authorities. The NLA was never an authentic indigenous force, but actually an arm of the US-armed-and-trained “Kosovo Liberation Army,” which now rules over the gangster state of Kosovo, crime capital of Europe. A “peace accord,” the Ohrid Agreement,was brokered by the West, which kept the NLA essentially intact, albeit formally “dissolved,” while the Macedonian government was blackmailed into submission. I wrote about it at the time, here and here. Follow that last link to read about the George Soros connection. Soros was originally a big booster of Macedonia, handing them a $25 million aid package and holding the country up as a model of multiculturalism. However, the Macedonians soon turned against him when he sided with the Albanians in their demands for government-subsidized Albanian-language universities and ethnic quotas for government jobs. When he told them to change the name of the country to “Slavomakejonija,” they told him to take a walk. Soros, a longtime promoter of Albanian separatism – he played sugar daddy to a multitude of front groups that promoted the Kosovo war – is now getting his revenge. Prime Minister Gruevski, for his part, charges that the sudden uptick in ethnic violence and political turmoil is the work of Western “NGOs” and intelligence agencies (or do I repeat myself?) with the latter playing a key role in releasing recordings of phone conversations incriminating several top government officials. A not-so-implausible scenario, given what happened in neighboring Ukraine. Speaking of which: the government of President Petro Poroshenko is leading the country into complete financial insolvency and veritable martial law. Aid money from the West is going into the prosecution of the ongoing civil war, and the country has already defaulted on its huge debt in all but the formal sense. Opposition politicians and journalists are routinely murdered and their deaths reported as “suicides,” while it is now illegal to describe the ongoing conflict with the eastern provinces as anything but a “Russian invasion.” Journalists who contradict the official view are imprisoned: Ruslan Kotsaba, whose arrest I reported on in this space, is still being held, his “trial” a farce that no Western journalist has seen fit to report on. Kotsaba’s “crime”? Making a video in which he denounced the war and called on his fellow Ukrainians to resist being conscripted into the military. Antiwar activists throughout the country have been rounded up and imprisoned. Any journalist connected to a Russian media outlet has been arrested. "Not only would it be a crime to question the legitimacy of an organization (UPA) that slaughtered tens of thousands of Poles in one of the most heinous acts of ethnic cleansing in the history of Ukraine, but also it would exempt from criticism the OUN, one of the most extreme political groups in Western Ukraine between the wars, and one which collaborated with Nazi Germany at the outset of the Soviet invasion in 1941. It also took part in anti-Jewish pogroms in Ukraine and, in the case of the Melnyk faction, remained allied with the occupation regime throughout the war." Ukraine is showing its true colors, which I identified last year, to the point where even the usually compliant Western media is forced to admit the truth. But no matter! It’s on to the next regime-change operation in the West’s relentless pursuit of a new cold war against Vladimir Putin’s Russia. Ukraine yesterday, Macedonia today, Moldova and perhaps Kaliningrad tomorrow. The EU and its American allies won’t be satisfied until they have Putin’s head on a pike – or until they’ve ginned up the twenty-first century equivalent of the Cuban missile crisis. The major media have completely bought into this propaganda campaign, including some alleged "libertarians." Antiwar.com is virtually the only major media outlet – yes, we’re major media, we have a Drudge link, after all! – that is bringing you an objective analysis of events in the former Soviet bloc. From the US-engineered coup in Ukraine to the current shenanigans in Macedonia, we’ve been pretty much alone in bypassing the government propaganda and giving you the facts. A group of our supporters has recently donated $33,000 in matching funds, so now’s your chance to double your contribution to the fight to change our foreign policy of perpetual aggression. Do we really want to make Russia our enemy, and risk a nuclear confrontation? I know your answer to that question is an unequivocal "No! ", but unless we begin to generate some grassroots opposition to our policy of meddling in the former Soviet bloc we just may have World War III on our hands. Your contribution is 100% tax-deductible. So why not deprive the US war machine of that money – and send it to those who are working day and night for a more peaceful world? Please go here to make your donation today.